A big thanks to AirStone for partnering with Domestically Speaking on our new fireplace! What a transformation! 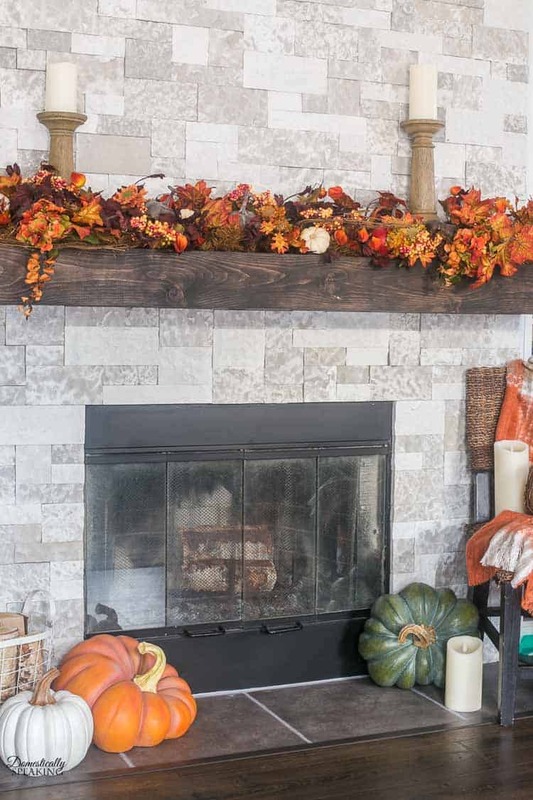 We recently made a big update in our family room with a gorgeous DIY faux stone fireplace makeover. It’s amazing what a change this has made to our family room. It feels cozier. It looks amazing. And it was an easy DIY project that you could tackle. 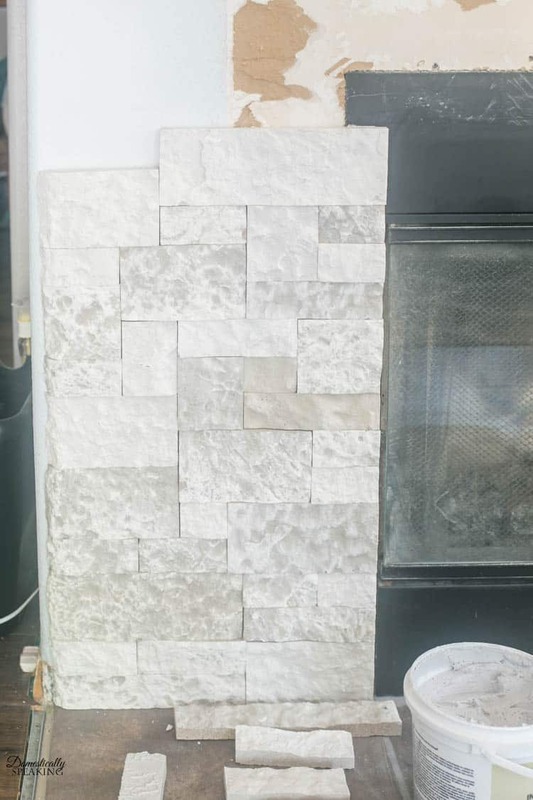 We installed the AirStone from floor to ceiling in our fireplace transformation. 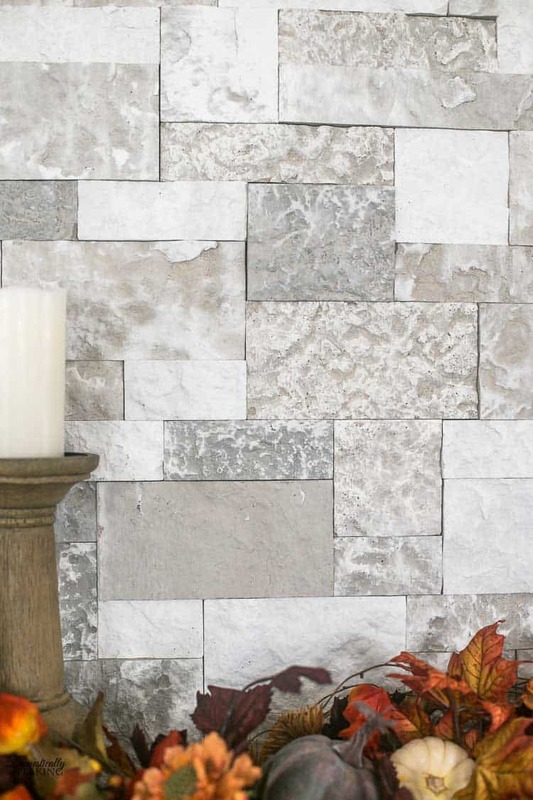 Airstone offers 3 color combos, we selected Birch Bluff. I loved it because it fit perfectly in our home’s color palette. It has browns, grays and white tones. 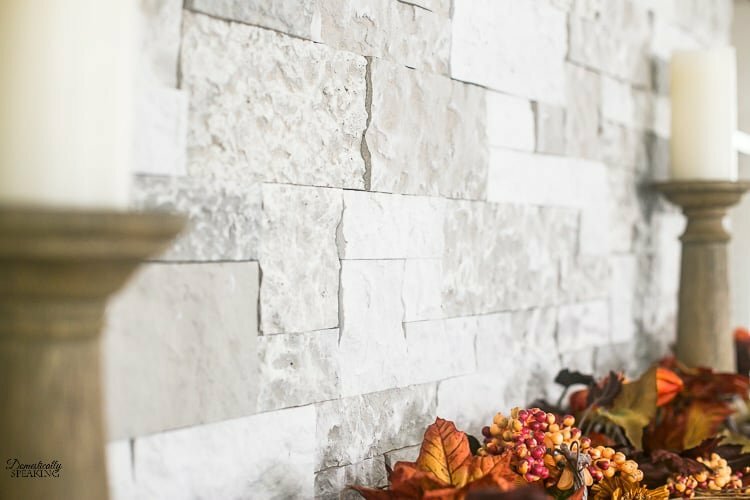 AirStone also has Autumn Mountain which has beautiful, warm brown tones and they offer Spring Creek which has a variety of gorgeous grays. So let’s get into the install info! In the photo above you can see on the far left side their finished edge stone. This makes finishing off an edge super easy. It also comes with a matching piece that you can create a corner edge with. So you have regular pieces and you have finished edge pieces. They come in various lengths and they come in two different heights – 2 inch and 4 inch. 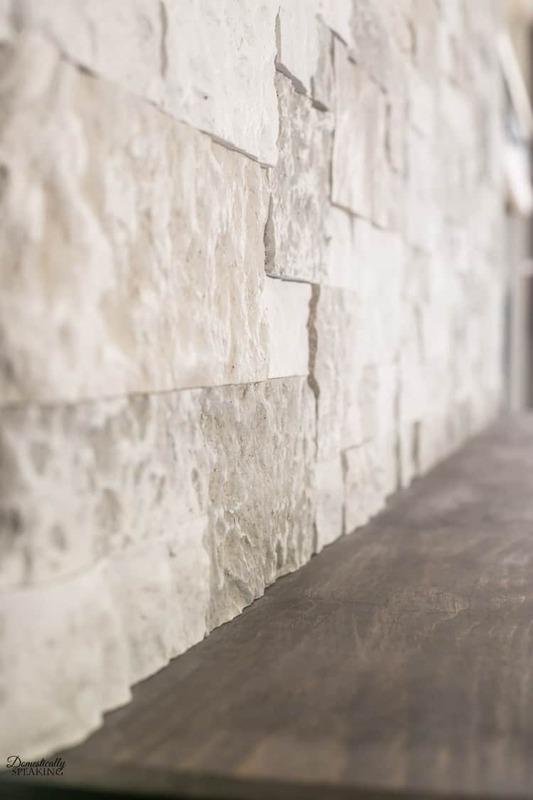 Airstone is made from 70% recycled material which helps to keep the product light yet it’s super durable. There are various ways you can cut Airstone. 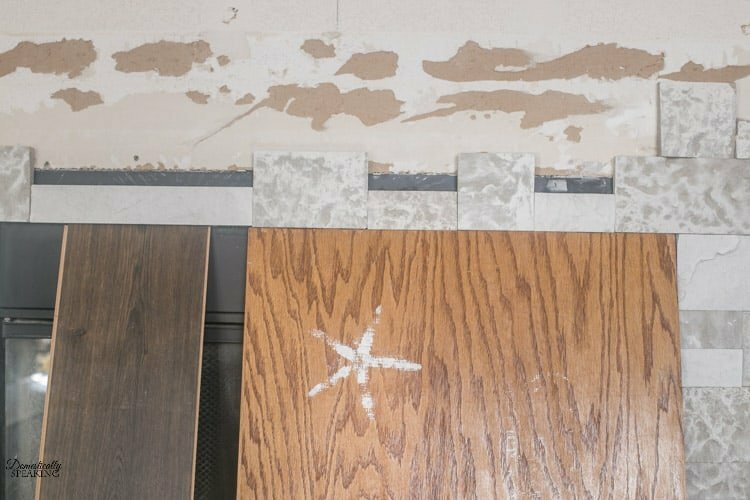 We had our wet saw out from doing our backsplash, so we used that during our install process. You can use a hack saw though… so super user friendly! 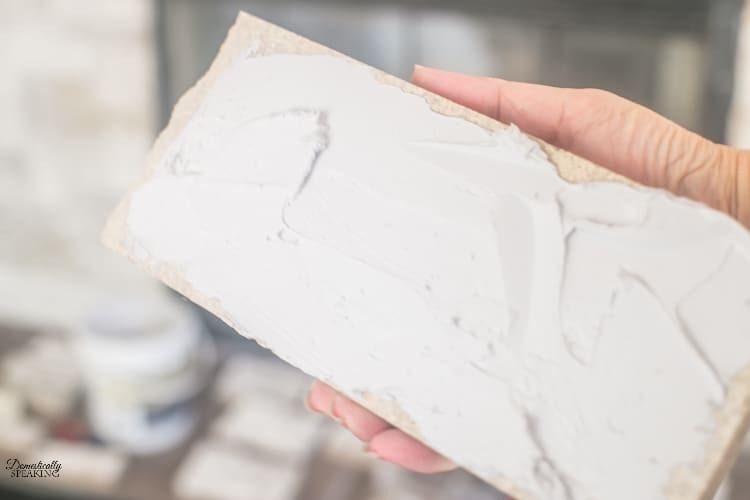 Airstone has an adhesive for indoor installation. All you need is a putty knife to spread it on. You want to spread it on like frosting! We started on the bottom left corner and started working our way up to the top of the fireplace opening. Making sure to mix up the sizes and vary the colors as we went gave us the look we wanted. Once we finished the left side to the the fireplace opening, I worked on the right side. When we went across the top of the fireplace opening we used a level to pencil a line at the bottom of where the stone needed to sit. We used various boards to help keep them stabilized until the stone dried for a couple hours. 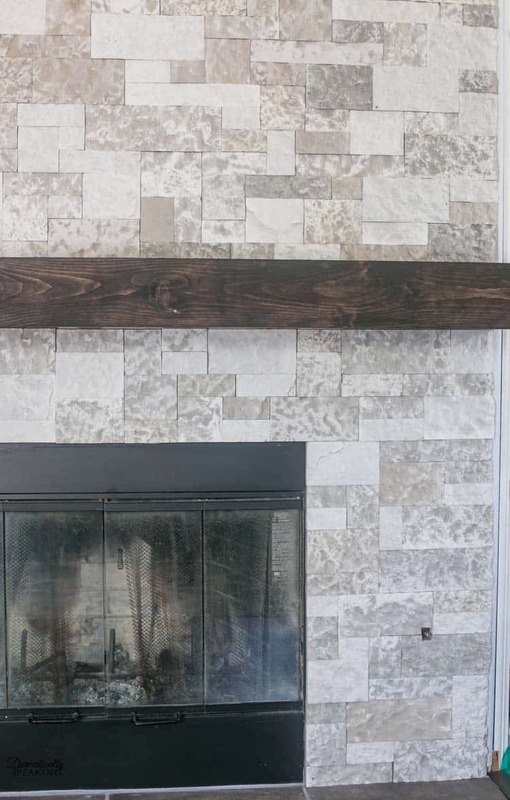 I’ll be sharing how we made our Fireplace Mantel in the next couple weeks! We kept working our way up until we reached the ceiling. We worked on this DIY project for about a week, spending a few hours on it each day. This is definitely a doable DIY project for a beginner!!! Airstone has great videos on their site to help you work through all the steps. Look at the textures and the variety of colors! It really does look and feel like real stone! Here it is with our fireplace all decked out for fall. We absolutely love how it turned out. We love the variation of colors that perfectly blend in our home. We love the texture and warmth it brings to our family room and we LOVED how easy it was to install. So if you’re thinking about making over your fireplace I highly recommend you checking out AirStone. Hi Laura! Thank you – we love it! Boxes are in the $60 range and we used about 5 1/2 boxes for our fireplace area. The space is about 6 feet wide and 9 feet high.